One group is outgoing and daring, while the other is rather timid and apprehensive. You’re feeling kinda curious, so you decide to transplant the gut bacteria from the daredevil mice into the more “mousy” rodents. And vice versa. A couple days later, you check the respective mouse quarters and are beyond shocked to find a ginormous party going on in the “timid” cage. Somehow, someway, swapping out the gut bacteria between the two groups not only altered their gut microbiome, but also modified their behavior. No, this isn’t some scenario that I pulled out of thin air. Rather, this very experiment is taking place in laboratories around the world, with the results making their way into legitimate scientific journals. There’s no doubt about it, the gut and the brain are surely connected. 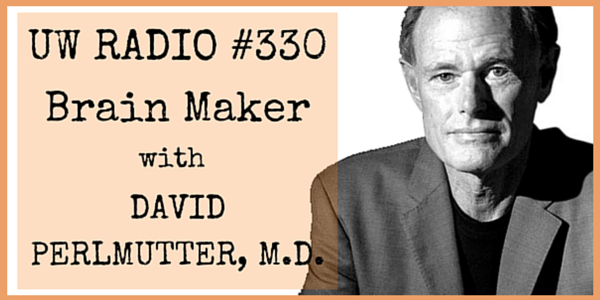 On this week’s episode of Underground Wellness Radio, Dr. David Perlmutter, author of Brain Maker: The Power of Gut Microbes to Heal and Protect Your Brain — For Life, returns to the podcast to reveal how gut bacteria are seeming to play a HUGE role in the development of ADHD, depression, Alzheimer’s, autism, and more. I tell ya, my guests have been on a roll lately. This episode is killer! Click the PLAY button at the top of the post to listen to the entire episode. See you next week with Rich Roll! This entry was posted on Tuesday, May 12th, 2015 at 10:01 am and is filed under podcast, wellness. You can follow any responses to this entry through the RSS 2.0 feed.